We are very happy with the delivered machines from Darin. 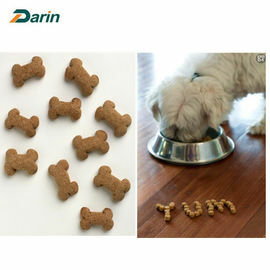 I recommend Darin as a business partner for the start-up of your production plant. I can only say how very happy I am with this machine. It is cutting our labor cost in half and making our product the same size and shape every time. The money you invest to Darin machines are much far less than that of other US or European machines and give you a big advantage against competition. 125kg/hr Biscuit Making Machine/Biscuit Forming Machinery/Biscuit Processing has original design, compact structure and high automation. We use all stainless steel to cover the whole production line. All working procedures, from feeding, calendaring, shaping, wastage recovering, drying to cooking, can be accomplished in one time. Choosing us is your wisest choice. Jinan Darin Machinery Co., Ltd. is an ISO9001 certified company specializing in food machinery and related packing machine since 2006, and all the machines are CE approved. Darin machine runs in more than 50 countries including USA, Germany, Brazil, Italy,Spain,Holland,Australia,Mexico,Egypt,etc. With more than10 years’ experience and technology accumulation, we’d like to offer the best after sales service to all of our customers. Hundred of moulds and dozens of technical formulas make it possible to produce all kinds of popular biscuits, such as cream biscuits, calcium biscuits, multi-vitamin biscuits and vegetable biscuits. Dental Care Pet Biscuit Making Machinery can produce different shapes of biscuits, such us round , bone, triangle, or long sticks. Dental Care Pet Biscuit Making Machinery can be combined freely according to the condition of customer’s workshop space and requirement of biscuit technology. These all can reach the ideal purpose. The line use imported electric components and its speeds are changed by frequency conversion. They save energy and are dependable, May be controlled single or combined. Darin: With more than 10 years experience in designing and manufacturing food machines, Darin feels proud and confident to introduce our machines to you and your esteemed company as one of the most competitive supplier in this business. What we strive to do all the time is providing innovative machines for our customers. Q: What materials Darin adopted in those machines? Darin: All the parts that touched with Darin will use food grade SS304, PU belt, strong carbon steel or appointed material for the bearing parts. High quality electronic components supplied by well-reputated company like Siemens and WEG. Q: How to get a proper quotation with good price? Darin: Contact us directly and provide as more information as you can, like the product pictures, weight, capacity, voltage and frequency of the motor requested, delivery date if there's urgently need. Quotation will be sent to your inbox immediately once everything is clear. Q: When will the machines be shipped? Darin: Normally around 45 working days. Q: How to visit us if you're having a business visit in China? China Good Quality Pet Food Extruder Supplier. Copyright © 2016 - 2019 foodextrusionmachines.com. All Rights Reserved.